With the Genesis wave sweeping across the Federation, and no way to stop it, book 2 is the conclusion to book 1, finally resolving the story. We discover the fate of the settlers on Myrmidon, and also find out whether or not the Federation can really stop the Genesis wave. I really feel these two books should have been combined, even if it was at the loss of some plot points. The first book ends, frustratingly, at a huge cliffhanger. While cliffhangers within a book are okay, cliffhangers between books aren’t, really. The question: did the fifty million inhabitants of Myrmidon survive the Genesis wave? Was the borrowed technology from the Romulans successful? Yes, but not very. Though they’ve survived, the Bolian planet of Myrmidon is now a Class-L wasteland, and its inhabitants must fight for survival against the moss creatures, who have unleashed this wave in the first place. The wave has been survived, but it must be stopped. Several different groups and teams head off to discover the true source of the wave, and Geordi LaForge gets to work on a way to stop it for good. By the end, factions are rushing about a secret asteroid base and there are subterfuges, sacrifices, and explosions galore. This book definitely ups the ante from the first book, with far more action and adventure (including Leah Brahms, physicist-turned-starship-captain, who finds herself in command of a motley gang of renegade Klingons, which I felt was the best story arc in the entire book). Characters still lack development. Geordi is forced to part with both of his romantic interests, and the poor guy is forever alone once again. Everyone else is pretty static against the events that happen. They’re not bad characters, but they serve the story, pretty much. Don’t expect much else. 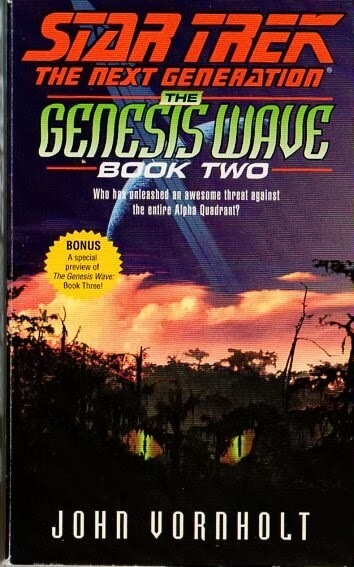 Overall, The Genesis Wave book two isn’t a bad book. It finishes up the story begun in book 1 (despite the fact that there is a completely superfluous book 3), with a good dose of action in there. It reads pretty much like a Star Trek book should read, but you’re still better off spending your time watching the TV show.